Cathi Biggins, Rosemary Biggins, Sean Biggins, Joan Carlin, and Virginia Biggins Carlin contributed to this story. An 1890 biography of James Biggins states that James and Owen Biggins were born in Co. Monaghan, Ireland, and immigrated to Illinois in 1840. This is important to me because my great great grandfather, Patrick Biggins, lived across the road from James and Owen in Will County, Illinois. According to Cathi Biggins, great granddaughter of James, Owen and James came to Illinois through a Canadian port. They "worked on the Illinois & Michigan Canal and, with what they earned, bought their land from same." James Biggins was born in 1822. In the 1850 census, his last name was listed as Bagan. He was age 22, born in Ireland, worked as a laborer, and lived on the Hendricks farm in Northville Township, LaSalle County, Illinois (family 80). Northville is in the northeast corner of LaSalle County. In 1851, James purchased farmland from the Illinois-Michigan Canal Commission in Will Co., Illinois. His name was listed as Beagan. His land was on Normantown Road in what is now Romeoville. The James Biggins farm was next to a farm owned by his younger brother Owen Biggins. Romeoville is about 40 miles east of Northville. On February 9, 1861, James Beggins married Catherine Prior (1830-1913). They had six children: Mary Biggins, Owen Biggins, Eugene A. Biggins (1863-1937), James B. Biggins (1865-1908), Edward M. Biggins (1870-1951), and William F. Biggins (1875-1966). James died in Will County on June 15, 1884, at the age of 62. The biography of James Biggins appears on pages 568 and 569 of Portrait and biographical album of Will County, Illinois: containing full page portraits and biographical sketches of prominent and representative citizens of the county, together with portraits and biographies of all the presidents of the United States and governors of the state. Chicago: Chapman Bros., 1890. Cathi Biggins, a great granddaughter of James, says she was told that their name was Bennett before it was Biggins. "My great aunt who confirmed what my father had told us regarding our 'real' name. The story was that our name was O'Bennett and that James Biggins was an English soldier who was killed and his papers were taken by James O'Bennett and this is how he came to America. The story doesn't make sense as Owen came with James Biggins and he would have needed papers also. I do think the original name was other than Biggins and that the story of the English sailor was embellishment (blarney) added to enchant us as young children." Owen Biggins was born in 1825. In the 1850 census, his last name was listed as Bagan. He was age 25, born in Ireland, worked as a laborer, and lived on the Rood farm in Mission Township, LaSalle County, Illinois (family 2182). Mission is the next township south of Northville, where his older brother James lived. In 1848, Owen purchased farmland from the Illinois-Michigan Canal Commission in Will Co., Illinois. His name was listed as Bagin. His land was on Normantown Road in what is now Romeoville. The Owen Biggins farm was next to a farm owned by his older brother James Biggins. Romeoville is about 40 miles east of Mission. In 1855, Owen Bagans married Rosanna O’Callaghan. They had no children. Sometime in the 1870s they were divorced. Owen died on April 20, 1885, at the age of 60. The April 23, 1885 issue of The Will County Commercial Advertiser contained an obituary: "Died:- At his residence in Dupage on Monday, April 20th, 1885, Mr. Owen Biggins. The funeral took place yesterday with a solemn high mass celebrated at St. Dennis church by Rev. Dr. McGovern." 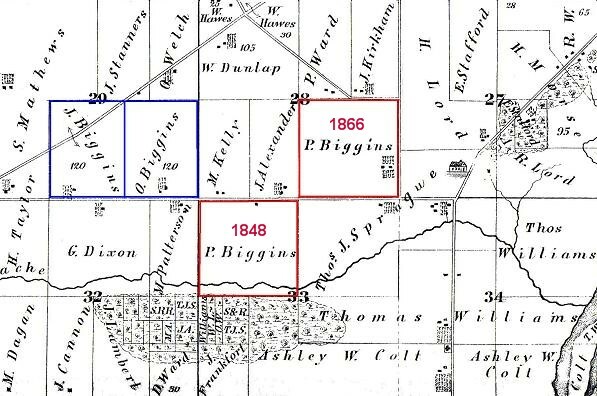 Six Sections from the DuPage Township plat map for 1873. The Patrick Biggins land is outline in red: the 1848 plot to the south, the 1866 plot to the north. The road running east-west between the two Patrick Biggins plots is Normantown Road. The road on the east side of the 1866 plot is now called Luther Road. The Sprague school is east of the 1866 plot on Joliet Road. The road running diagonally north of the 1866 Biggins plot is Naperville Road. The James and Owen Biggins land is outlined in blue. The road running diagonally through the James Biggins land is now Interstate 55, which runs between Chicago and St. Louis. Across the road from the farms owned by James and Owen was a farm purchased by my great great grandfather Patrick Biggins on the same day as Owen. Patrick was 15 years older than James and 18 years older than Owen. The biography of James Biggins mentions his brother Owen, but not Patrick. Patrick came to America after first living in Ontario, Canada, where his second child, Ann, was born in 1835. While the last name of James and Owen initially was different, it eventually converged on Biggins. There were no Biggins household in the Griffith's Valuation property survey of 1848-64 for County Monaghan. The prevailing names were Began (16 households) and Beggan (14 households). In 2008, I had my Y-chromosome DNA tested. The next year, Sean Biggins, a descendant of James Biggins who lived across the road from my ancestor Patrick Biggins, had his DNA tested. The tests confirm that there is a fairly close relationship between our great great grandfathers, Patrick and James Biggins, but not close enough to confirm that they were brothers or even close cousins. Sean and Peter are two among 10 men within Clan Colla who have "Biggins" DNA. Their names all are derived from beag, the Irish word for little. Surnames were adopted in Ireland for the first time in the 11th and 12th centuries. Historian Peadar Livingstone reported these names in southern Co. Fermanagh and northern Co. Monaghan. See Biggins/Beggan Irish Roots, Family Tree DNA Biggins Project, and DNA of the Three Collas. Sean and Peter have the BY3164 SNP, as do the two other "Biggins" testers who have tested for it under Big Y-500. They share no SNP, however, that would differentiate them from the other two testers. As indicated by the aqua values for markers 413b and 561, Sean and Peter share unique values shared by all 10 "Biggins" testers among the large group of Clan Colla testers. As indicated by the yellow values, Sean and Peter have differences in eight STR markers. The first four are faster mutating markers, but the last four are slower mutating markers. The following is from an email from Virginia Carlin, November 17, 2009, to her daughter, Joan, who found this page on the Internet. Virgina was born Virginia Mary Catherine Biggins in 1921. She is the daughter of William F. Biggins (1875-1966) and Elizabeth Molloy (1895-1988) and the granddaughter of James Biggins (1822-1884) and Catherine Pryor (1830-1913). From my grandfather's obituary -- Catherine had 6 children. Mary (not Mae?) died at birth or shortly thereafter (maybe a breach?). Catherine, aunt Mary told my mother, never forgot it. She never had another girl but fervently wanted one. Five boys followed. There was a George, and I think he was the one who was thrown from his horse and died as a young man, and I recall my mother said he was married. (I must ck that out sometime with St.Denis' Church records). I also had read my grandfather's obit, at the church years ago. Eugene and Mary moved into Joliet before 1920 when my mother, who was living with them, married my father in Sept. 1920. I was born in Nov. 1921. The house they had bought was a virtual mansion, up several STEPS from the avenue where it was located. It had a huge vestibule on entry with a ceiling to floor mirror, two stories, huge living room, dining room and great kitchen. Eugene was no businessman but Aunt Mary wanted the best. They hadn't yet sold their farm but had a renter who was farming some of it. My father had begun an Oil business with another man, a Mr. Williams. They sold oil to farmers, most of whom my dad knew. It was the era of farm machinery replacing manual labor. All went well until the great depression 1929. Aunt Mary and Eugene couldn' sell their farm or their lovely home, got their renter out of the farm house and moved back to the farm. Then they rented out the house. That's how Ray & I could visit them in the summers. Life was hard for everyone. Our family had a nice warm home but taxes, Insurance, heat, food, etc. had to be paid. Money was going out but none was coming in. There were no jobs. Men were knocking on doors for food. My mother gave a sandwich, a cookie, and a cup of coffee to any who came--always a few each week. They sat outside. Someone told us about chalk marks on our street near our curb--which we learned was a welcome sign to others to our house for food. Most people wouldn't or couldn't share what they had. Eugene and Mary, while living in town, came often to visit us. Eugene never worried about anything. My father had to handle finances etc. for them. When I was little I would crawl up on Eugene's lap and play with his whiskers, calling them fetters. If a certain lamp was on and it cast shadows, he would put his hand up at an angle and and turning his fingers, he could make figures of shadows on the wall which fascinated me. Aunt Mary was bossy and kept him hopping, but many times he ignored her. When Ray & I would visit on the farm Aunt Mary had a list of chores for us to do but if we wanted to go out on our own or play in the haystack, he would tell us to "get going, run, before she finds you!" He loved to play old records on the old Edison' phonograph which enterained us in the evenings. Aunt Mary hated it - probably because she had to listen to it so often. She had a pet hen she called "Biddy". It came faithfully, every morning we were there, to her back porch door and Aunt Mary would say "come in Biddy". She ran through the kitchen, thru the long dining room and into the living room, jumped up on the couch and laid an egg on the little sheet Mary put there for her. (Talk about fresh eggs-----you couldn't get any fresher!!!! Never learned what happened to Biddy. Probably died of old age; never for dinner. Uncle Eugene died first. My parents took in aunt Mary in her later years who was becoming senile but not from Alzheimers. P.S. When the depression was ending my Dad got a job at Gerlach-Barklow Co. He learned Lithography and had many friends. He was a quiet man, but good as gold to his family and everyone.